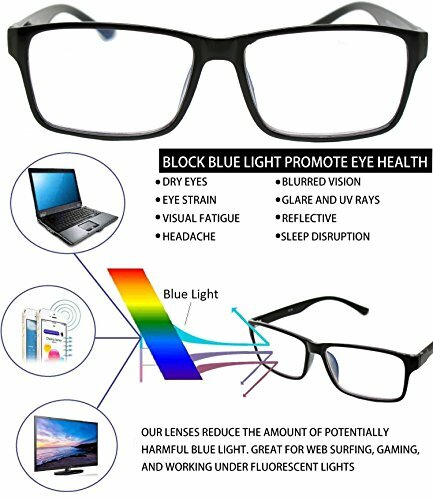 Anti blue light computer glasses with microfiber eyeglass pouches: filter out high blue light emitted from electronic devices, like computer screen, smartphone, TV, etc. Standard Sized Glasses - One Size Fits Most! Provides full protection from harmful UV rays and meets ANSI Z80.3 impact standards. clean under lukewarm running water using a normal neutral cleaning liquid and dry with a soft clean cloth. do not use solvents(such as alcohol or acetone),or aggressive chemical deterrents, as they may damage the finish or structure of the eyewear. Polycarbonate impact resistant lens - 100% Protection Against Harmful UVA/UVB Ray - Protect your eyes in style! Block out glares and eliminate color distortion. Standard Sized Glasses - One Size Fits Most! High quality design glasses well crafted for long lasting durability. This glass provides full protection from harmful UV rays and meets ANSI Z80.3 impact standards. Try today absolutely risk free with our 30 Days Money Back Satisfaction Guarantee. If the product does not work out for you, simply contact us for a full refund or replacement. If you have any questions about this product by Visual +, contact us by completing and submitting the form below. If you are looking for a specif part number, please include it with your message.